In Vienna music is at home: the Musikverein. 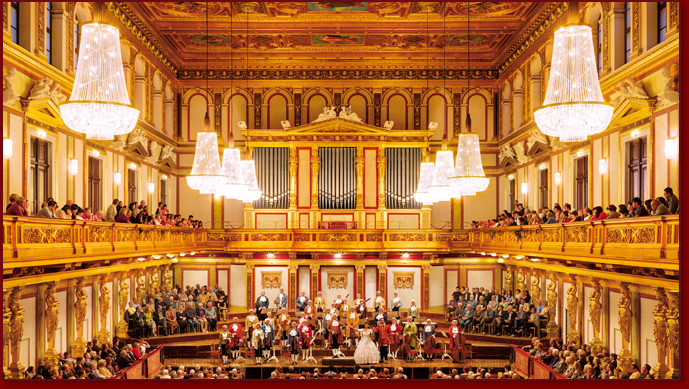 The Musikverein was inaugurated by Emperor Franz Joseph in 1870. Since then the Golden Hall in the Musikverein is known by friends of music all over the world, not only because of the annual worldwide broadcast of New Year’s Concert by the Vienna Philharmonics, but also for being permanent seat of the Vienna Philharmonics and main stage of the Vienna Mozart Orchestra. The Golden Hall fascinates the concert guests being a unique architectonic and acoustic master piece. The Golden Hall in the Musikverein is air-conditioned. The Danish-Austrian architect Theophil von Hansen (1813 – 1891) created with the Brahms Hall in Musikverein the ideal frame for the perfect music enjoyment. Since the restoration after the original plans the Brahms Hall in the Musikverein displays his by visitors from all over the world admired, original beauty in full splendour. 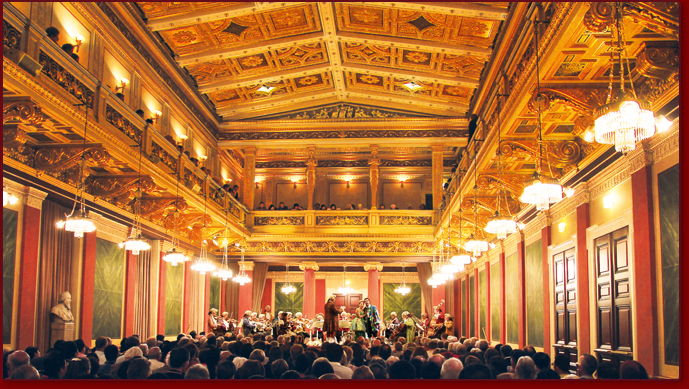 On account of its excellent, world-famous acoustics the Brahms Hall is a frequent venue of the Vienna Mozart Concerts. The Brahms Hall is equipped with air-condition. Wiener Musikverein, (English: “Viennese Music Association”), commonly just quoted The Musikverein, has a twofold meaning: it is the name of its famous Vienna concert hall, as well as the short name for the music society, Gesellschaft der Musikfreunde [Society of Music Lovers] which owns the building. This building is located on Dumbastraße behind the Imperial Hotel, between Bösendorferstraße and Karlsplatz. However, because Bösendorferstraße is such a small street, the building is better known as being between Karlsplatz and Kärntner Ring (part of Ringstraße loop). The back of the building faces Canovagasse. The concert hall was built by the Gesellschaft der Musikfreunde Wien, on a piece of land given by Emperor Franz Joseph, and it was opened on January 6, 1870. A historic organ was installed in it by the Austrian firm Rieger, in 1907. The Musikverein is famous for its acoustics and is considered to be one of the three finest concert halls in the world, along with Boston’s Symphony Hall and Amsterdam’s Concertgebouw. 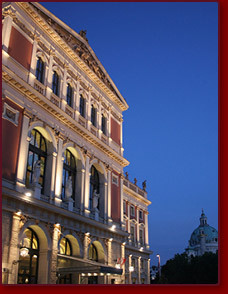 It is the home to the Vienna Philharmonic. The Große Musikvereinssaal, or Goldene Saal (Golden Hall), is forty-eight metres long, nineteen metres wide, and eighteen metres high. It has 1,744 seats and standing room for 300. Every year, the Vienna New Year’s Concert is held here. and several new rehearsal and concert halls have been installed.